Where is the Best Picture nomination? All from her point of view, Grief-stricken Jackie Kennedy (Natalie Portman) recounts the events leading up to the assassination of her husband. This is captured through an interview with an unnamed journalist (Billy Crudup). You’d expect this version to strike as nothing more than a run-of-the-mill Oscar bait biopic. In fact, Jackie surprises on all levels. Director, Pablo Larraín, introduces his provoking take on the subject of JFK from the beautifully captured perspective of Jackie Kennedy with a raw documentary-feel to it. Her complexities are highlighted upon, while her pearls and hairspray lean more towards background noise. 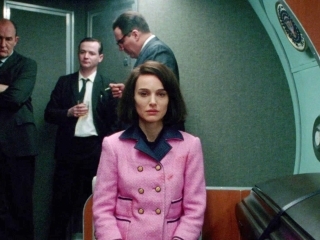 Natalie Portman emerges into the role of Jackie with ease – from the iconic appearance (perfected by Madeline Fontaine’s costume design), to her poised nature and accent above all. Portman nails this powerful portrayal, while JFK, played by Caspar Phillipson hardly features at all, allowing for a fresh take on the subject. Peter Sarsgard, John Hurt, Nancy Tuckerman and Greta Gerwig all perform well in their respective roles, though don’t equate to the excellency of Portman’s magnitude. The biopic would be dull and all too conventional without a performance as great as this one. The framing and shot composition often leave a feeling of dread, due to its stunning sense of realism. This is nonetheless aided by the soundtrack, which reigns high above them all in what can be seen as a ‘contradictory’ year of cinema. The camera shots remain as tight as Jackie’s posture, which adds a clever, claustrophobic element to the viewing experience. Footage from the assassination is often intertwined within the film, adding to its ever-expanding sense of realism. Perhaps not a film to ‘love’ as the themes bring great sadness, but definitely a picture to greatly appreciate, despite its dreary undertones. Not everyone’s going to like this film – some may find the themes too bleak, others will thrive off the cinematography and its authenticity. Pablo Larraín’s biopic is gripping – a critical character study that is worth your time.